So, I guess it’s officially spring now, right? Or is that not until the 21st? I don’t know which is technically correct, but I’m going to go ahead and say it’s spring now, since that makes me much happier. We’ve managed to get away without any snow this winter (…yet. ), which also brings me a ridiculous amount of joy, since snow is pretty much the worst thing ever invented (Minute 1: oh look, beautiful snow! Minute 7: ugh why is it all slushy everywhere and why can’t I drive anywhere and why are my feet cold and wet, this is so rubbish.). Chickpea salads seem to be becoming a bit of a theme here at Amuse Your Bouche – and each time, they get fancier and fancier. 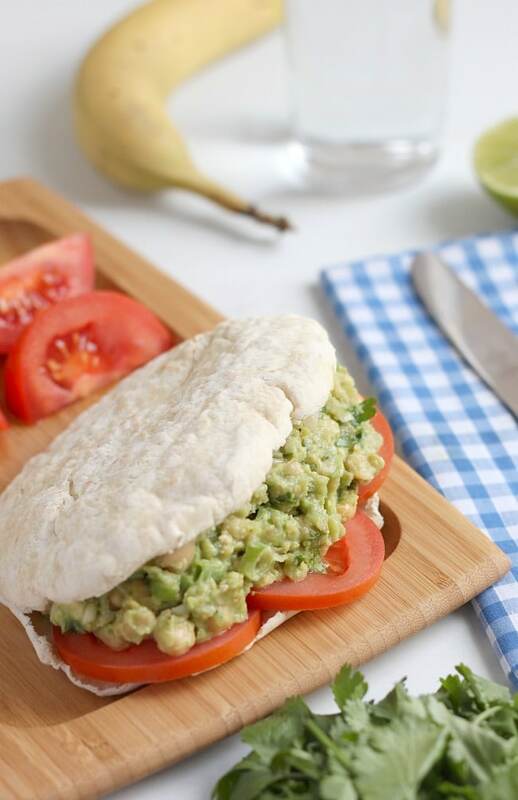 The humble chickpea salad sandwich turned into a version with walnuts and goat’s cheese. Then came avocado chickpea salad (a match made in heaven). I just can’t stop. They make such a quick and easy lunch, and they’re so versatile – mix them up with whatever flavours you fancy (or whatever you have lurking in the fridge). This time I decided to go for a Greek version. Greek salad is probably the only salad I would ever actually consider ordering at a restaurant – generally, salad isn’t really my cup of tea, but show me anything with olives and feta cheese and I’m sold. 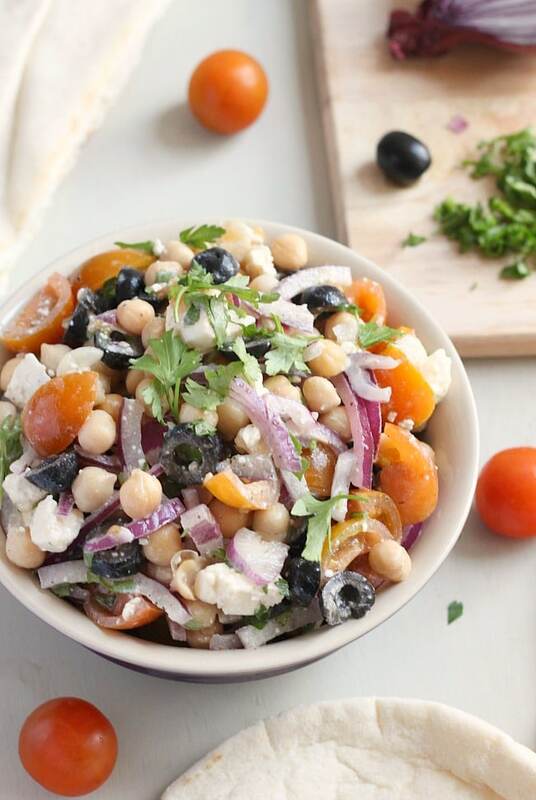 Turning a normal Greek salad into a Greek chickpea salad is beneficial for a couple of reasons. Firstly, it’s more nutritious – you get a great protein boost from the chickpeas. And secondly (and most importantly), you don’t have to include any lettuce, which is undeniably the worst part of any salad. 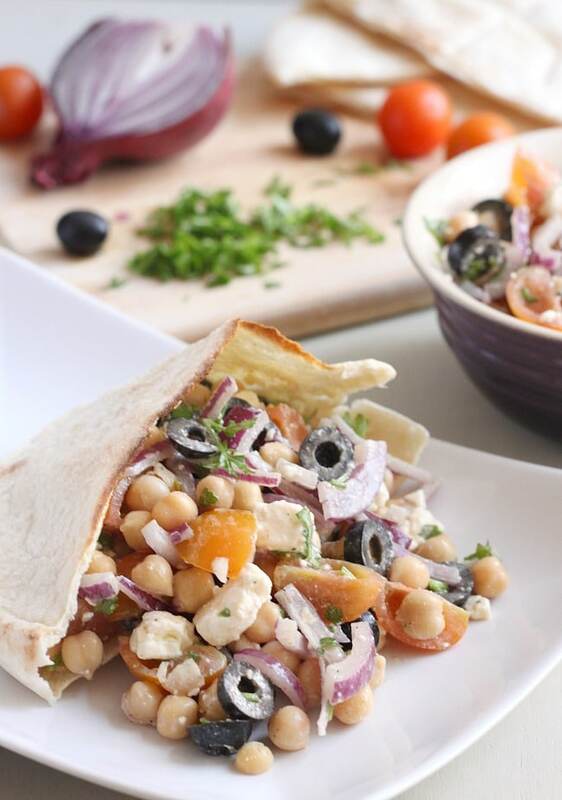 I served my chickpea salad in a pitta bread, because why wouldn’t you want extra carbs? If you’d rather not, it’s awesome on its own too. It’d be perfect to take in a packed lunch, since the flavours only meld together more and more over time. 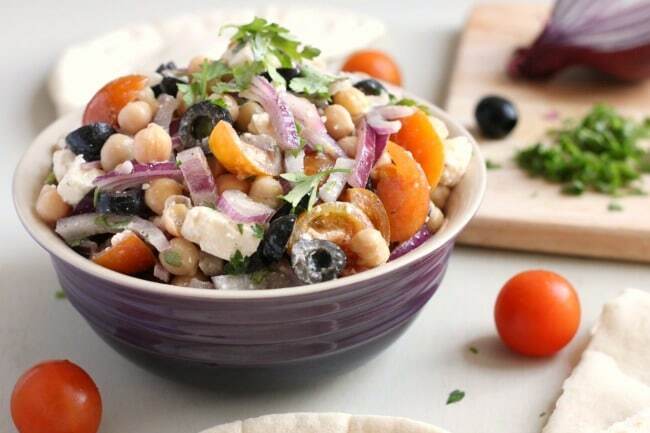 The mild flavour of the red onion finds its way into every mouthful, and the salty feta and olives are the perfect contrast to the sweet tomatoes. Those Greeks sure do know what they’re doing. And to think, they also invented veggie moussaka – complete and utter geniuses. Combine all ingredients in a large bowl, and mix well. You can either serve the salad immediately, or store in the fridge for a few hours to allow the flavours to develop. And bonus points, I didn’t have to go near the stove! Oh god that sounds horrible! I totally melt in the heat, around 20 suits me just fine! Glad this refreshed you a little!! I’ll have to try this recipe. Looks tasty and healthy. It’s getting a bit autumnal down in Oz so the food hemisphere’s are aligning a bit, I just posted a smashed chickpea salad so it seems we a thinking along the same lines. 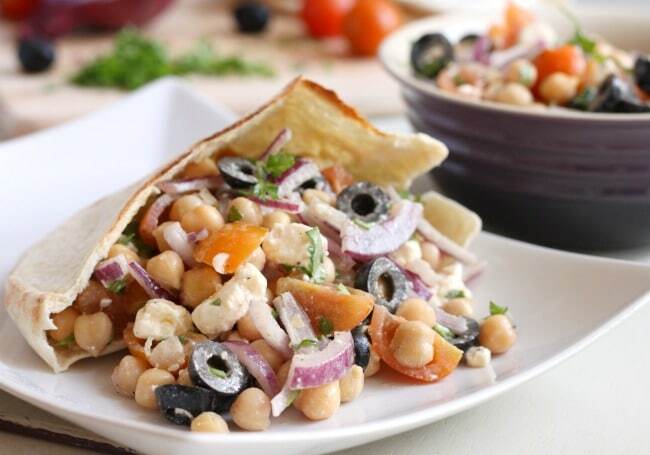 Your Greek inspired chickpea salad looks delicious too though. this is the best idea! being Greek myself i LOVE the classic Greek flavors. I love this “salad” without lettuce. Ahhhh I feel for you about the snow! I hate it! I looooove chickpeaaaas! 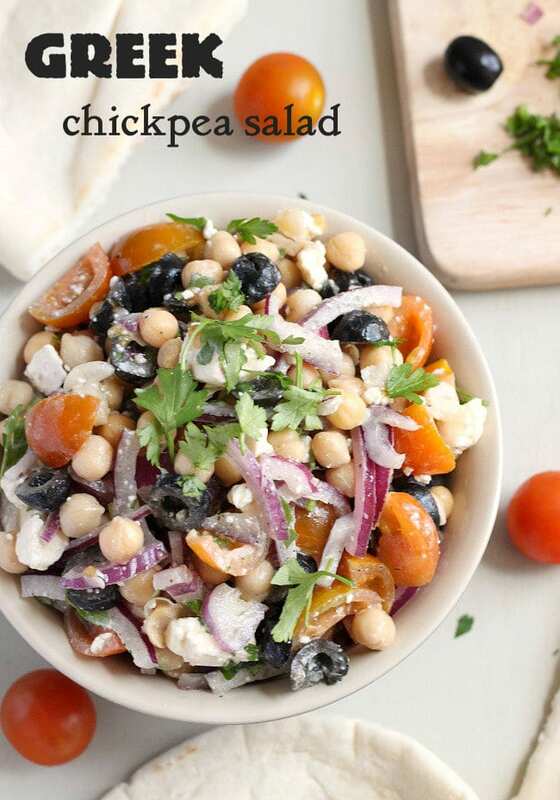 I can’t believe it, but I’ve never had a chickpea salad. Not ever. And now I’m dying to try them, starting with this Greek version. I want loads of it all snuggled up in a pita! MMMMMM! Brilliant, my dear! I’m in need of some new lunch ideas and this would be perfect! I don’t think the weather here can decide if it’s spring or not–one day it’s snowing and the next it’s 70 degrees and sunny! Ugh that’s so annoying, I’d never know what to wear! Omg! That was delicious! That recipe is now in my Recipe Box and will be a regular at my table. Yum, that looks delicious! Be grateful you haven’t had any snow–where I live, we’ve had nothing BUT snow for months now. I am soooo ready for spring. Also, just wanted to say I really love your blog and your recipes. I recently stopped eating meat and I’ve gotten so many great ideas for vegetarian meals from you, so thanks! I was planning on buying olives this week and you have just provided what I bet will be a yummy recipe to use those olives. This salad sounds so good! It’s exactly the kind of thing I’d make in a big batch and eat every day for a take-to-work lunch. Super flavorful, clearly good cold, and substantial enough to actually keep you going–perfect. What a great salad, love the flavor combinations. Also very nice how you present this salad in a pita bread to give your readers other ways to enjoy this meal.